Michigan rejoined the Big 9 in 1917, after which it was called the Big Ten. Yost immediately got back to work. In 1918, Michigan played the first game against Stagg's Chicago Maroons since Chicago ended Michigan's winning streak in 1905. Michigan defeated the Maroons, 18–0, on the way to a 5–0 record. 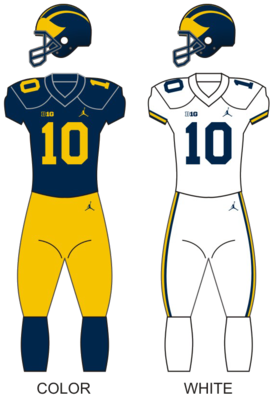 The next three years were lean, with Michigan going 3–4, 5–2, and 5–1–1, in 1919, 1920, and 1921. 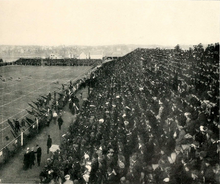 However, in 1922 Michigan managed to spoil the "Dedication Day" for Ohio Stadium, defeating the Buckeyes 19–0. Legend has it that the rotunda at Ohio Stadium is painted with maize flowers on a blue background due to the outcome of the 1922 dedication game. Michigan went 5–0–1 in 1922, capturing a Big Ten title. In 1923, Michigan went 8–0, winning another conference championship. The 1924 Wolverines, coached by George Little, saw their 20-game unbeaten streak end at the hands of Red Grange. 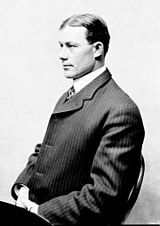 After the 1924 season, Little left Michigan to accept the head coach and athletic director positions at Wisconsin, returning athletic director Yost to the head coaching position. Although the 1925 and 1926 seasons did not include a conference title, they were memorable due to the presence of the famous "Benny-to-Bennie" combination, a reference to Benny Friedman and Bennie Oosterbaan. The two helped popularize passing the ball in an era when running held dominance. Oosterbaan became a three-time All-American and was selected for the All-Time All-American team in 1951, while Friedman went on to have a Hall of Fame NFL career. 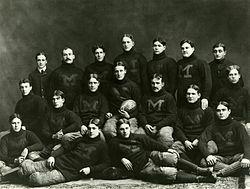 Also during 1926, Michigan was retroactively awarded national titles for the 1901 and 1902 seasons via the Houlgate System, the first national titles awarded to the program. Other major selectors[who?] later retroactively awarded Michigan with titles in the 1903, 1904, 1918, 1923, 1925, and 1926 seasons. Michigan currently claims titles in the 1901, 1902, 1903, 1904, 1918, and 1923 seasons. ^ "Fields of (amateur) dreams: the 22 US college football teams with crowds bigger than the NFL average « Sporting Intelligence". Sportingintelligence.com. 2011-02-09. Retrieved 2013-10-20. ^ Official 2007 NCAA Division I Football Records Book (PDF). National Collegiate Athletic Association. 2007. Archived from the original (PDF) on 2008-06-25. ^ "Past Division I Football Bowl Subdivision (Division I FBS) National Champions (formerly called Division I-A)". ncaa.org. Archived from the original on March 25, 2008. Retrieved 2008-06-12. 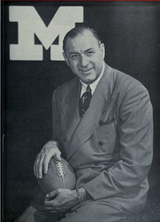 ^ "University of Michigan Football Annual Team Records – MGOBLUE.COM – University of Michigan Official Athletic Site". Mgoblue.Com. Retrieved 2013-10-20. ^ "Michigan Wolverines Football Schedules and Future Schedules". fbschedules.com. FBSchedules. Retrieved 14 January 2019.